Product brochures are both frequently consumed and highly valued by B2B technology buyers, according to a recent report from Eccolo Media. The report, which was the second in a series, was based on data from a survey of 100 people responsible for influencing or making B2B technology buying decisions (33% influencers; 67% decision makers). More than half of respondents (57%) said they had looked at product brochures/data sheets from B2B technology vendors in the past six months, the most engagement with any content type. Other commonly consumed content types include: Emails from vendors (52% have read in the past six months), white papers (52%), competitive vendor worksheets (42%), and case studies/success stories (42%). The least consumed content types are eBooks (24%) and podcasts (24%). Product brochures/data sheets are also seen as the most influential content type on decision-making, with 39% of respondents ranking them as one of the top five most persuasive assets. 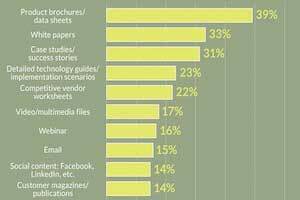 Other content types ranked as being very influential include: White papers (33% rank as a top five asset type), case studies/success stories (31%), detailed technology guides (23%), and competitive vendor worksheets (22%). The content types seen as being least influential on buying decisions are eBooks (7%) and tweets (4%). 48% of B2B tech buyers say they only consume 2 – 5 content assets before making a decision. The same percentage of buyers (52%) consume emails and white papers from vendors, but white papers are seen as being much more influential on the decision-making process. About the research: The report was based on data from a survey of 100 people responsible for influencing or making B2B technology buying decisions (33% influencers; 67% decision makers). Ayaz Nanji is an independent digital strategist and the co-founder of Inbound ContentWorks, a marketing agency that specializes in content creation for businesses and brands. He is also a research writer for MarketingProfs. His past experience includes working for Google/YouTube, the Travel Channel, AOL, and the New York Times.